Today I was given a rare treat. Mary McCormick asked me to participate in the Fund for the City of New York's annual celebration of the Sloan Public Service Awards. 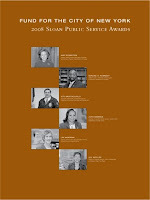 Each year, the Fund honors six civil servants for their outstanding contributions to New York City. The Awards were announced by Mayor Michael Bloomberg and a cast of luminaries at Cooper Union earlier this evening. I spent the day visiting the honorees -- educators, demographers, engineers, and others -- at their offices. It was an inspirational day. My dominant emotion was one of gratitude. Some of the best public service is basically invisible. If you're like me, you don't really think much about the water coming out of our faucets or the garbage cleared from our sidewalks, but of course this doesn't happen by accident -- it takes enormous effort by thousands of people. Kudos to the Fund for working to raise their visibility and honoring their hard work.